With 102 miles of the 228-mile West Branch of the Susquehanna River meandering through the county, there are plenty of water types for all skill levels. 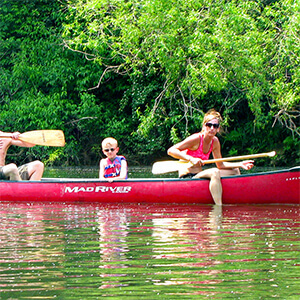 For more information about paddling the county's water passages, call 814-765-1410. 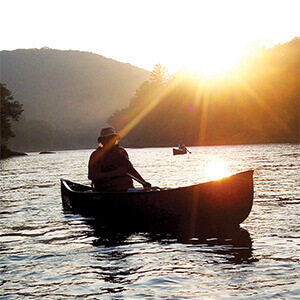 Whether your passion is navigating the water by boat, kayak or canoe, Clearfield County is a world-class water activities destination. Below are the suggested itineraries recommended by McCracken Canoe Sales and Rentals for the West Branch Susquehanna River. 20 miles - up to 8+ hours. Start at Starlight restaurant. From here to Bower is the steepest drop with Chest Falls. At 5 feet (Bower gage) it is fairly safe for moderate paddlers. Each inch of river height changes the difficulty. Above 6 feet you should have self-rescue skills as there can be long wave trains and steep drops enveloping you in river foam, leaving you not to sure , which way is up. Meaning - pretty scary. Or exciting if you are a little or a lot crazy. Next steepest drop is at Watts bottom. A little ways after that the river, backed up by Curwensville Lake gets very slow. You feel as you will never reach the end. Sometimes the wind pushes you back upstream. Don't be too disheartened... There are several point to exit the river in this stretch. Camp Corbly road bridge, Curry Run Bridge, Bells Landing Park, Lumber City Bridge with a long climb to the road or to the Canoe launch at Curwensville Lake. Car portage necessary to continue downriver from Curwensville. 9 mi. - 3 1/2 hours - Start Irvin Park or the Community Center in Curwensville. Easy stretch that mostly follows Rails to Trails. Watch for boons from the logging era. Exit Lower Witmer Park. 11 mi. - 4 1/2 hours - Starting on left bank at Elliott's Park- named for John Crissman's dog. A lot of sweat has turned an overgrown weed bank into a beautiful respite to picnic, fish and launch canoes and kayaks to head downriver. If you see John out be sure to thank him. A more remote stretch that winds itself through some gorgeous scenery. Watch for Bald eagles, deer, and other wildlife. Pause to explore a tunnel or two on your trip. I-80 bridges are about 2/3 of the way downriver. Exit on left bank below fenced area across from Shawville Power Generating Station. We are near here. 1 1/2 miles. If you are only looking for an hour or so of just paddling around. Get in behind Shawville store or church. Out on right bank where Millstone Run comes in. Portage required-by car recommended. Contact McCracken Canoe to help. (814) 765-1410 after hours (814) 496-9220. 13 mi. - 5 1/2 hours- Another remote and winding stretch withunparalleled beauty has easy calm waters floating between giant boulders to sometimes exciting ripples. Stepping Stones, placed here by giants of a bygone era used today by Bigfoot play hopscotch across the river-writers imagination at work-paddle around and through them and use your own imagination as you create your own story as to the placement of these magnificent structures. Exit river right or river left just above Deer Creek Bridge. All boats exiting right bank must sport a PA Fish and Boat Launch Permit. 6 mi. -. 2 1/2 hours- Shorter easy stretch where you will see a few camps. Look for RING ROCKS left by lumbermen of a bygone era. Stop at Alder Run, climb up into the pines, and marvel at how two very different worlds can be so close. Take out Rolling Stone bridge right bank. 11 mi. - 5 hours - Steepest drop on the West Branch Susquehanna River is more challenging depending on water levels. Boulders were blasted to the sides to make room for timber rafts on way to market causing water to funnel and create wave trains. Then comes Moshannon Falls. You can always exit on right at head of the falls to scout or portage around them. Once past the falls water slows down as the river widens. 22 mi. -7-8 mi. - A longer slower stretch with few technical surprises except Buttermilk Falls. Though fish in the river here are sparse many of the tributaries hold feisty native trout. A hike up Bougher Run will lead you to a waterfall where you may cool off under original running water. Others offer hikes to scenic vistas. Paddle up Sinnemahoning Creek to take out. 17 mi. - 5 1/2 hours - This stretch mostly follows the RR tracks as you head toward Renovo or North Bend to finish 80 miles of Wilderness from Clearfield. 23.5 Mi. - Anderson Creek is classified as a Class II-III+ classification whitewater stream, and falls from the highest mountain east of the Mississippi River on Interstate I-80 in Clearfield County, Pennsylvania. This is a challenging course and not for the leisure paddler. Along with the whitewater you will face several small dams that are easy passage. The water level is best in the spring and only passable when the water is high. 790 Acres - This manmade lake is one of the county's hidden treasures. Its banks are decorated with foliage that is sure to impress any viewer throughout the seasons. There are a few bald eagles that call this area home and plenty of additional activity on the property to keep you entertained for days. There are no horsepower boating restrictions so if you are in a kayak or canoe expect some rougher water. 6-8 hours- This is the longer trip at six to eight hours of paddling depending on the speed of the current and how much playing around you do. It’s also a flatwater section that some of the locals avoid due to its slower current, but it’s popular for 1st time solo paddlers or younger paddlers in recreational kayaks. 4-5 hours - This is the most popular section because of its faster current and it’s winding path through some of Clearfield County’s remote woods. On this twisty section you’ll enjoy a slightly faster current, occasional obstacles and fun riffles and eddies, and you’ll enjoy some of Central PA’s scenic views that take you past remote villages and few campsites. And if you look closely you’ll see evidence of early homes, industry, and even a once major travel route during the 1800s that eventually succumbed to time. 20-acre Parker Lake is tucked nicely in the tranquil arena of Parker Dam State Park. Paddling this lake will allow you to enjoy the woodlands and accompany the wildlife under Mother Nature’s umbrella. All boats must display one of the following: boat registration; launch permit or mooring permit from Pennsylvania State Parks, available at most state park offices; or launch permit from the Pennsylvania Fish and Boat Commission. Electric and non-powered boats only, motorized boats are prohibited. 20-acre - If you are looking to float the backwoods. backroads. backwaters. with the local waterfowl Shagger's Inn is the place to be. The setting for this stage is typical of a shallow water impound. The wetland contains one of the few nesting areas in PA for Osprey. Waterfowl is common in spring and fall. The surrounding Moshannon State Forest is an excellent place to find Scarlet Tanager, Purple Finch and Wild Turkey. 379 acres- Visitors can enjoy the beauty of this lake when they rent a kayak or canoe at the Treasure Lake Marina. Although this is a gated community anyone can enjoy its activities while staying at a cabin or one of the lodging properties. 102 Miles of the West Branch Susquehanna River is located in the boundaries of Clearfield County. Trip times vary depending on water levels, paddling skills, weather conditions. They are also PADDLING times-not floating times. A Boy Scout merit badge can be earned by completing the trip between Clearfield and North Bend. The badge "80 Miles of Wilderness" can be earned by everyone...and is based on a book of the same name. Contact DuBois Council BSA for more info on this. Phone McCracken's Canoe @ 814-765-1410 after hours 814-496-9220.